Jane Koerner is a contributor to Writers on the Range, the opinion service of High Country News. Her memoir, Off Trail: Finding My Way Home in the Colorado Rockies, will be published by University of Oklahoma Press under her new pen name, Jane Parnell, in spring 2018. Of all the stories I heard from the undocumented immigrants I interviewed when I was a journalist during Ronald Reagan’s presidency, Ignacio’s haunted me the most. A Catholic nun in southern Colorado’s San Luis Valley arranged the meeting in the cramped dining room of a homeless shelter. Shutting the blinds and switching off the light, she explained the ground rules. “I will translate your questions and his answers. He will face the wall. He can’t bear to be looked in the eye while he tells his story.” I heard a door opening, feet shuffling, and Ignacio appeared. The nun filled in the details each time his barely audible voice died. He had fled his village in the Guatemala highlands with his wife and children. Pedro was the eldest child, a teenager, whose nightmares perpetuated the horror long after their arrival in the United States. Few villages escaped the brutality of the American trained-and-supplied military. The day Ignacio’s village was torched, families were ordered out of their huts at gunpoint and adult males were singled out for immediate execution. When the soldiers swarmed Ignacio’s family compound, they forced Pedro and his siblings to watch as they threw their grandfather over a log and chopped off his hands, feet and head. To silence the dogs, they tossed them a meal of dismembered body parts. “How could anyone possibly believe it?” Ignacio whispered, his head half-buried in his threadbare cotton shirt as the nun translated. Ignacio and his son were caught between the military enforcing the status quo on behalf of owners of cotton fields and coffee plantations and leftist guerillas fighting for livable wages and basic human rights. When he turned 21, Pedro would have to choose sides. Now the survivors had to decide. Stay and die. Or set out after dark for Mexico and the border, risking death by murder or dehydration in Arizona’s Chihuahuan Desert. 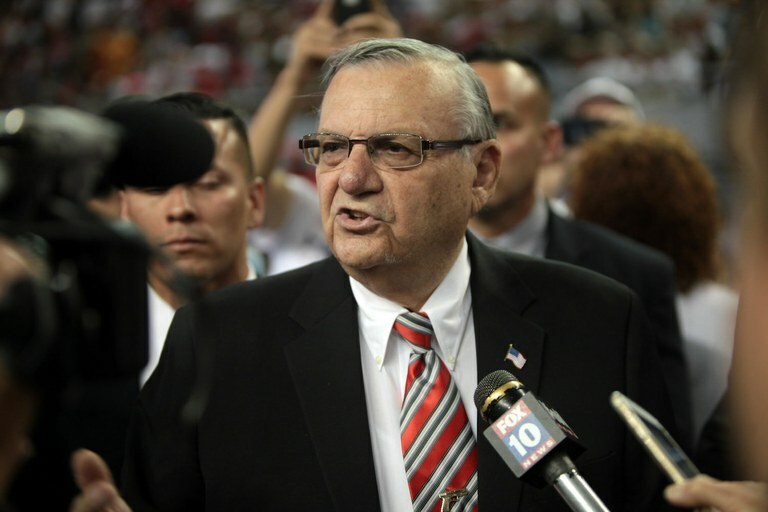 Joe Arpaio, photographed here in June 2016, campaigning for Donald Trump in Phoenix, Arizona. Unlike others who attempted the journey, they didn’t lose a single family member. With the help of the Catholic church, Ignacio and Pedro found jobs at Alamosa’s mushroom farm, a sweltering greenhouse with poor ventilation. Their combined wages couldn’t rent them an apartment so they alternated between the homeless shelter and rooms offered by fellow parishioners. I never saw them again after that unforgettable encounter. Thirty years later, a headline announcing President Donald Trump’s pardon of Maricopa County Sheriff Joe Arpaio in Arizona made me want to know: What had happened to them? Were they deported to face almost certain death? I could only hope that their application for political asylum was approved. Arpaio would be re-elected four times despite the civil rights lawsuits, unexplained deaths, bogus criminal charges against public officials who dared to speak out, and the spending of $142 million in legal fees and settlements, all paid for by taxpayers. It would take 20 years for voters to cast him out. This summer, a federal judge cited him for contempt of court, a misdemeanor, for defying a court order prohibiting his officers from detaining undocumented immigrants with no criminal record. Trump’s pardon coincided with Hurricane Harvey, which shrank the front-page column inches available for the story. Many of Arpaio’s other alleged offenses went unmentioned, such as the hundreds of sexual assault and abuse cases that went uninvestigated while sheriff deputies focused on illegal immigration. In traffic stops and raids of Latino neighborhoods, his deputies detained hundreds of suspected illegal immigrants, including law-abiding ones, as well as U.S. citizens and Mexican tourists. Inmates convicted of minor offenses or unable to afford their bail bond wound up in Arpaio’s outdoor Tent City, with its 120-degree-plus temperatures, rotten food, mandatory chain gang duty — and pink underwear as an extra humiliation. County jail inmates fared no better. A paraplegic arrested for possession of a gram of marijuana begged for a catheter so he could urinate, and his jailers strapped him to a restraint chair and broke his neck. Another inmate condemned to the restraint chair was beaten and shocked, then suffocated to death. Who committed the graver offense? A traumatized family who crossed the border illegally, or a sheriff whose racial profiling and mistreatment of inmates and retaliations against so-called political enemies bolstered his claim as America’s toughest sheriff and most unrepentant “birther”?